MILWAUKEE, WI – Suburban Harley-Davidson's Steve Rapp took his third straight win at the fourth round of the 2013 AMA Pro Vance & Hines Harley-Davidson series at Mid-Ohio Sports Car Course in Lexington, Ohio, but it was anything but a straightforward charge from the front of the field like his previous two wins. Rapp qualified his XR1200 motorcycle on the front row of the 21-rider field, but in a bizarre incident, had to change into a borrowed set of riding leathers on the starting grid when the zipper malfunctioned on his primary set. As the rest of the field completed the warm-up lap, Rapp changed into the new leathers and was able to start from his pole position, but running on cold tires, he fell back to fifth position on the opening lap. Rapp fought his way back into the lead on lap five, and from there waged a back and forth battle with Harv's Harley-Davidson's Travis Wyman, who led the first four laps of the 11-lap race. Wyman retook the lead on lap nine and the side-by-side action continued until the checkered flag, with Rapp barely taking the win, his third of the season, by a 0.173-second margin. "I thought, "Did I come all the way to Ohio for nothing?" That was terrible. I've never had a zipper stick. That was as close as you can cut it," Rapp said about his frantic wardrobe change on the grid. "It took me a couple of laps to get the tires up to temperature. Once Travis and I got together, I couldn't really ride how I wanted to, as hard as I wanted to, and I was a little tentative in some of the corners. In the end it came down to whoever got the best last lap, [and was] in the right place at the right time. It worked out [for me]." Behind the leading duo, Tyler O'Hara (Eco Fuel Saver/Scrubblade), Benny Carlson (Suburban Motors H-D), and defending class champion Michael Barnes (Spyke's H-D), fought a race-long battle for the third step of the podium, with O'Hara taking the podium spot after a coming out on top of a three-wide charge down the back straight on the final lap. Eric Stump (Fernet Insurance) finished sixth and Nicholas Hansen (Suburban Motors H-D) finished seventh at the head of a seven-rider battle for that position, with Josh Chisum, Hayden Schultz, and Shane Narbonne rounding out the top ten. The AMA Pro Vance & Hines Harley-Davidson series returns to action August 2-4 at Miller Motorsports Park in Tooele, UT. CLEVELAND, OHIO – 16 July 2013 SuperTrapp Industries, Inc. (www.SuperTrapp.com) is celebrating 42 years of being a leading manufacturer of comprehensive performance exhaust systems for a variety of motor vehicle applications, including motorcycles, ATV and automotive. 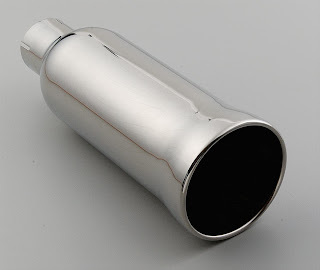 SuperTrapp WaveTech Exhausts (MSRP starts at $175.00) are designed for 4 and 6-cylinder sport compact imports. They are tunable, disc-based mufflers with a polished T-304 stainless steel body that includes a polished stainless steel closed end cap. The core is perforated stainless steel. Four different colors of optional end caps are available and sold separately including polished aluminum TrappCaps. Select models of SuperTrapp’s WaveTech automotive exhausts include twelve, 4” discs. WaveTech exahusts are available in different lengths and inlet diameters. Visit SuperTrapp.com for specific applications and additional product information. For more info, visit www.SuperTrapp.com or call 216-265-8400. Request complimentary catalogs and e-newsletters of SuperTrapp Industries’ various brands by clicking on the “Contact Us” tab. Become a fan of the SuperTrapp Industries family of brands such as SuperTrapp, Jardine and JayBrake on Facebook. Follow SuperTrapp and Jardine on Twitter. SuperTrapp, Kerker, Jardine, JayBrake and FPS Racing products are made in the U.S.A.